Mr. Abhinav Nautiyal, (VP) and Team, SIR Biotech India Limited with Mr. Vikas Sharma, Director & Chief executive, CSL. 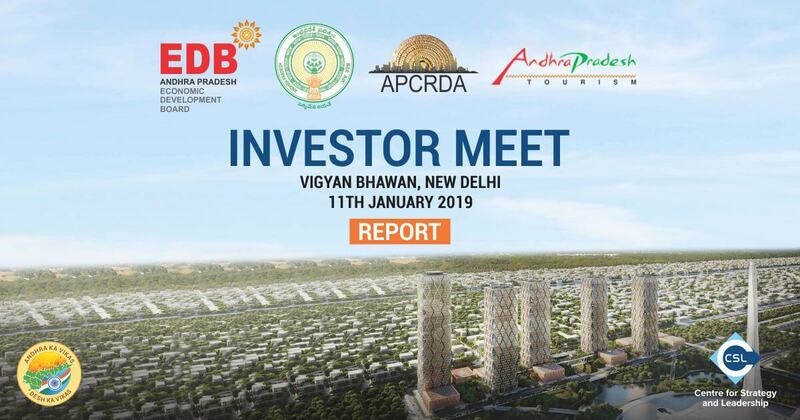 A Special Investor Meet was organized by Centre for Strategy & Leadership (CSL) for a select group of investors, interested in investing in the tourism, entertainment and hospitality sectors of Andhra Pradesh. The format was a one on one interaction between each investor and key Andhra Pradesh Government departments of Economic Development Board, Department of Tourism and Capital Region Development Authority and was supported by CSL. The meet was a follow-on activity to support the investor awareness and engagement objectives of the workshop series “Andhra ka Vikas, Desh ka Vikas”. Background: A Global Multi-Domain enterprise with industry domains that include hotels and hospitality, real estate and construction and agriculture. Background: A prominent infrastructure development company that has worked on commercial infrastructure projects across India. Represented by: Ms. Mallika Kakra (Asst. Manager Business Development) and Team. Background: Mobile Digital Movie Theatre, taking entrainment to each and every corner of the country. They are presently also working with Ministry of Petroleum, South Central Railways, Odisha Skill Development Sector, Chhattisgarh Samvad project and with Jharkhand government. Background: They are construction and infrastructure group with companies - Mannan Projects India Private Limited and Mannan Trading and Supply Chain Private Limited. They are into developing world class projects. They are based in India and Turkey. They have been associated with projects in the Middle East and the United Kingdom. Background: Tournament and official agency recognized by I.P.P.U. & affiliated to I.P.P.A. which is the Apex International Body of Pitching & Putting. Indian Golf Circuit is authorized to conduct tournaments of domestic and international levels in India. - The interested investors will submit their letter of intent though mail. - They will be provided with sector specific policies of Andhra Pradesh. - Depending on the further progress of the talks, site visits will be arranged.